When we first started doing the C2C method of crochet, we found there were imperfections when making color changes. In the left photo below you will see the pink arrows point to what we refer to as “ticks”. Regardless of how tight you carry your yarn, ticks won’t disappear on their own. Michaelene experimented until she found a way to eliminate them resulting in a cleaner C2C image (pictured on the right). The key is to always pull your yarn in from the front side of the panel, regardless if the front or back of that panel is facing towards you as you work. Watch the video below for a tutorial on color changes the 3amgracedesigns way. Michaelene takes you through several scenarios for color changing and carrying your yarn with a method that produces beautiful, clear C2C panels. While you’re there, subscribe to our YouTube channel to view all our How-To videos! 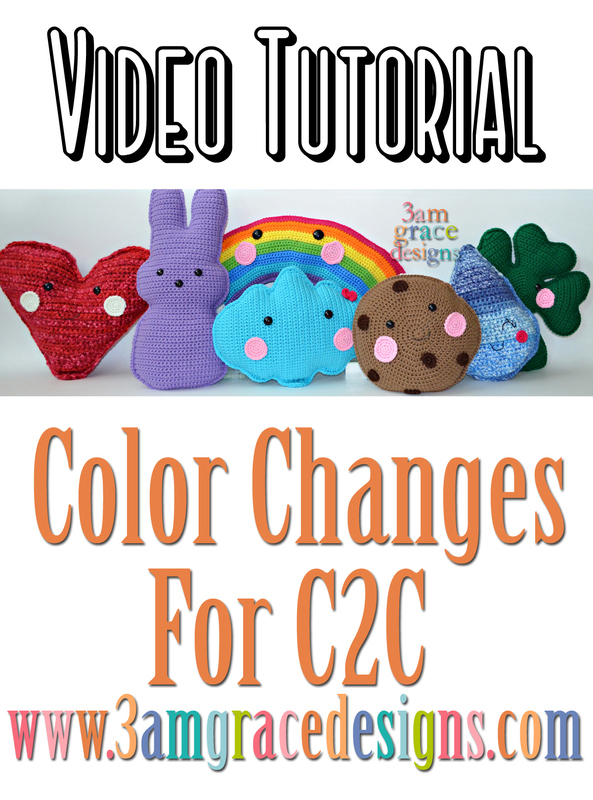 I loved the video on how to colour change on c2c. Now I am going to try it. Thank you. Hi Pat! You’re very welcome! Awesome, I wish I knew about this technique before I did my first C2C graph blanket. Will be using this information from now on. Hi Donna! Glad it helped! Awesome! Wish I had know about this earlier. 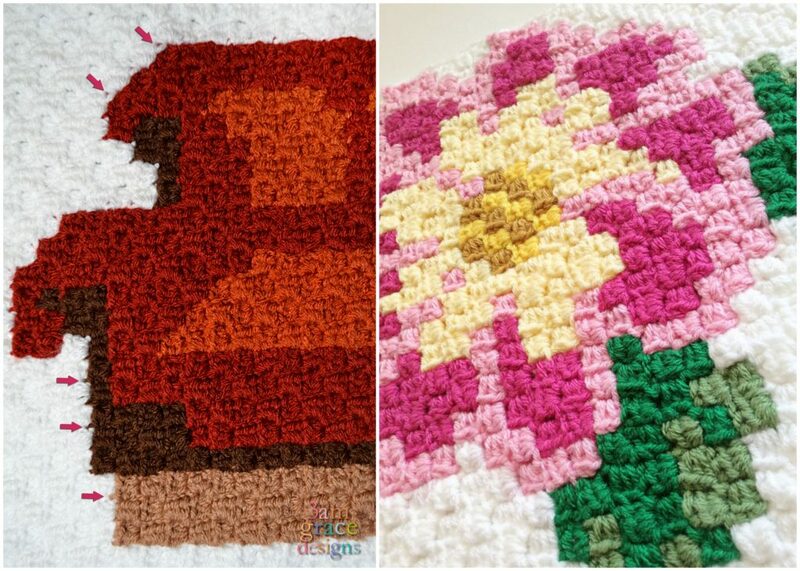 I’ll definitely do it this way for my next c2c project! Hi there! Glad it helped! We wish we’d done our first projects this way too! ? I’m a leftie also. It doesn’t matter which corner you start with. It will turn out the same either way. Brilliant, just brilliant. You have inspired me to try C2C again. I left if because I hated those little places that never looked right. Yay for new methods!!! Hi Elicia! Yay! So excited you’re inspired! This video was so helpful!! I’m excited to make the Grey’s Anatomy CAL but this is my first graphgan. This video has answered all my questions! Thank you for making this!!! Hi Jennifer! We’re so glad it helped!! Hi Morgan! I am a leftie also but I’ve never had this trouble to know the real cause. I wouldn’t think its due to being a leftie…but perhaps caused by reverting the whole square. Are you a member of our Facebook group? We have 4k helpful crocheters in there if you’d like to ask in the group. Tried your method of changing colors and it worked great. My lines are so much better. I made some pillow covers for a Christmas gift but now they look so sloppy I’m going to do them over. Hi Ima! We’re so glad it was helpful!! I can’t tell you enough about how much this video helped me! I really appreciate the time you took to show each step and how clear you are. Thank you so much! That makes our hearts so happy! Glad to have helped! So to do it this way I would have to make sure that my tails and working yarn are always on the backside of the work right? Thank you so much for posting this! I’m working on my first C2C right now as a gift for someone, and I’ve frogged it so many times because I didn’t like how the color changes were looking. So glad to have this technique in my toolbox now! I’m curious what the back of the work looks like when it’s finished, though. Is it messy? I know the tails get weaved in, but I’m wondering if you can see the carryovers on the back…? I (Donna) never carry, as I don’t like the extra tiny ticks on the back. Michaelene carries all the time. It’s just a personal preference. If you do it without carrying, as the video instruction shows, your back looks pretty clean as well. I absolutely loved this video! I just wish that I had seen it before I started my project😟. I watched some others but this one really explained everything. Thanks so much for creating this.